To help identify and track acceptance activity, a Digital Fingerprint is captured when a customer accepts a Quote. Both the customer and the Quote Author can view the Digital Fingerprint. 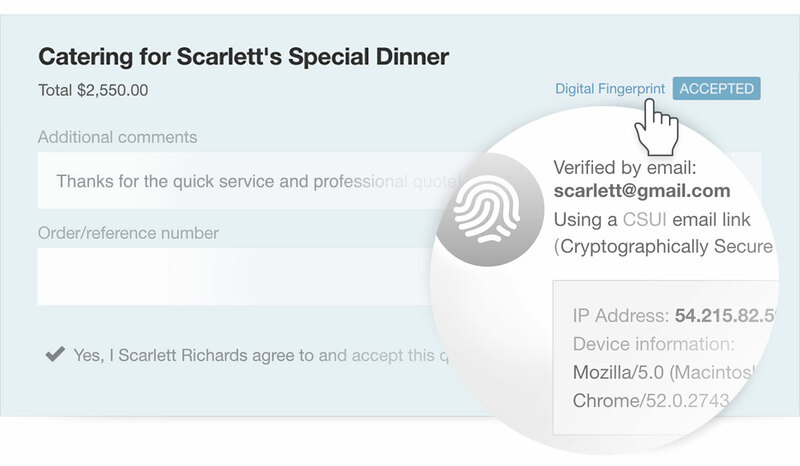 No Digital Fingerprint is recorded when a Quote is Accepted On Behalf of the customer. Verified email address, using their CSUI email link (Cryptographically Secure Unique Identifier). Device information (Hardware, OS, browser, type and version). The Quote URL was copied and manually sent on to the customer. A recipient of a Quote forwarded the email to a third party. If the third party accepted the Quote, the verified email address would show incorrectly as the original recipient’s email address. Changing a customer's email address will also alter the verified email address displayed. A record of the original email address can be found under the Contact’s recent activity log. Can I rely on the IP address being accurate? It’s possible that the IP address and device information may not always be entirely accurate. For example, if the recipient accessed the quote through a VPN, or if they intentionally masked or altered their identity. How to lookup an IP address.